The recent Laura Mercier sale (Buy 2 Caviar Sticks Get 3) was too nice to pass up. I had a couple of Caviar Sticks a while ago but I ended up giving them to my sister who enjoys minimalistic eye makeup. I have wanted them again since now I almost always base my eyelids with cream type eyeshadows for more color depths. I picked up Sapphire, Pink Opal, and Grey Pearl this time. Sapphire is a pigmented deep blue with subtle yet visible shimmer. Pink Opal is a very pale pink with iridescent shimmer. Grey Pearl is a creamy taupe with silver undertones. All three colors are well pigmented and go on very smoothly. 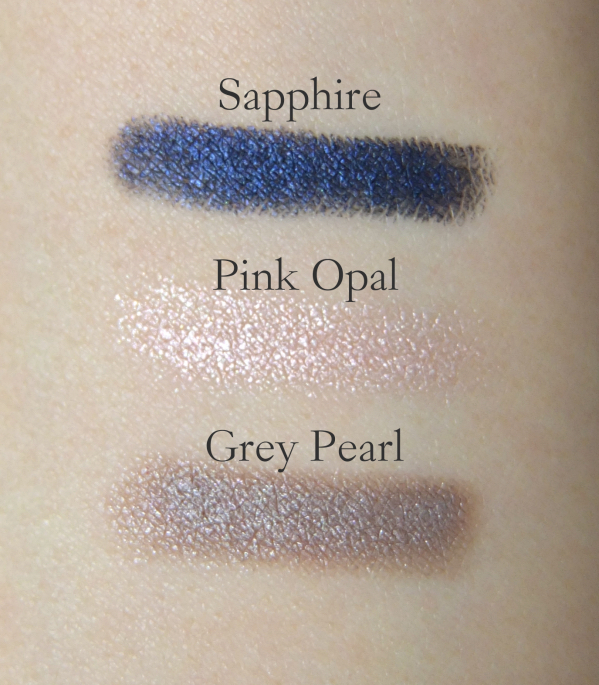 Sapphire needs a bit more work to blend in properly since is is intensely pigmented, but it is one of the few dark blues that actually looks classy and complex. Love it. Pink Opal is perfect for highlighting. The shimmer catches a lot of light and the iridescent effect is quite pretty. Grey Pearl is such a gorgeous taupe shade with cool undertones. The consistency is even creamier than the other two. It is great to use as an all-over lid shade. 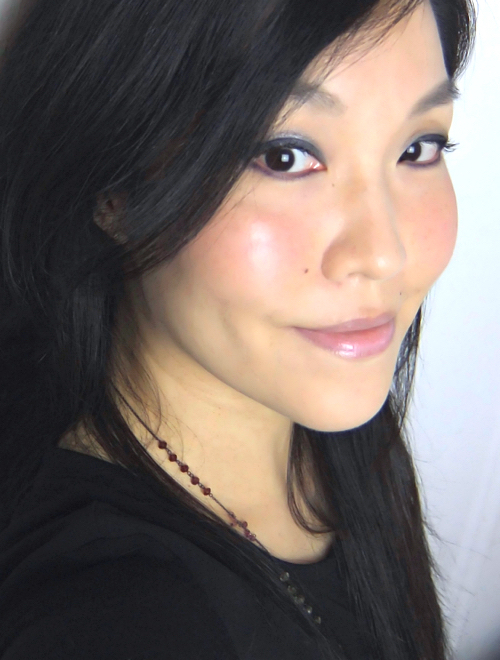 I usually wear powder eyeshadows over, but this time I tried to create a smoky eye look just using these Caviar Sticks only. Impressively, the colors stayed on all day without creasing or fading. I started by putting on Sapphire close to the lash lines. Then I blended the harsh lines with Grey Pearl. Its softer texture works very well to create the soft hazy effect. Pink Opal was used just a bit in the inner corners to brighten the whole look. 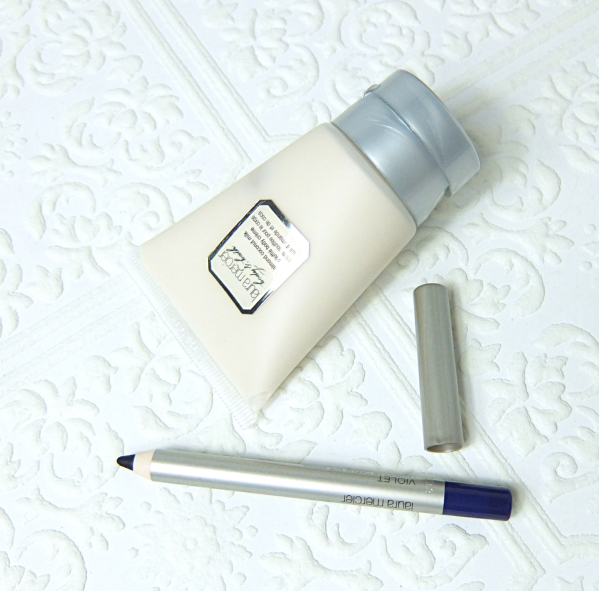 I'm also wearing Laura Mercier Long Wear Crème Eye Liner Violet on the lower lash lines. These mini samples were included in the order. I personally think this is a smart move since we often spot similar sales from bigger retailers as well. Lately I've been seeing nice samples and freebies offered for direct orders from the brands, and this would make direct sales more competitive. Makeup products used for this look are listed below. 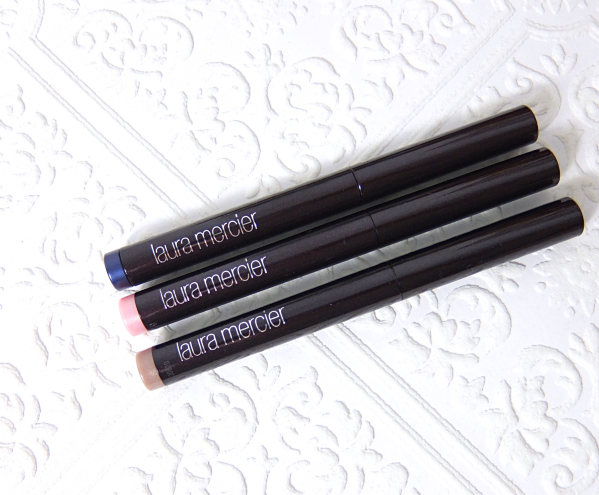 Do you like creamy eyeshadow pencils like Laura Mercier Caviar Sticks? How do you wear them? Soooo pretty! Love these sticks. I like your cheeks and lips here too. Hey Lena, oh buy two get one free IS indeed too good a deal to pass! I have four of these including Sandglow, Grey Pearl, Khaki, and Amethyst. I love them all and use them quite often! I never really use more than one though. I'm really lazy. I kinda use one of these as a base, and then blended some eyeshadow into the crease. That's all I do! I had Amethyst and love it, too! I think ByTerry also have this kind of eye shadow pencils, right? they're quite famous as well. I am a fan of cream eyeshadow pencils and very often apply them as base for powder eye shadow and just wear them alone on the lids because they are usually very long lasting..
Oh I heard By Terry is amazing and there is not comparison, but is is like over $50 per pencil. I'm jealous you have an easy access to KIKO, though. 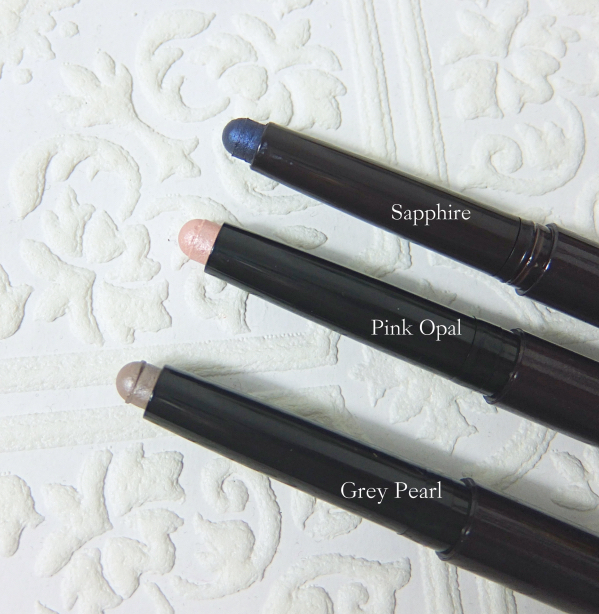 I use simple pencils like L'Oreal Voluminous Smoldering Liners most, but I've always wanted a deep blue pencil like Sapphire. It is just perfect. Gorgeous pics! I'm beggining to really like laura mercier! LM has some solid classics! OOH! Such nice picks and the samples are really nice! Grey Pearl is one of my favorites for easy! You look lovely with the smokey eye with all the shades. What a deal that was! And what a gorgeous look you created with all three! I have Pink Opal and Grey Pearl and they are pretty! They just don't stay on my oily lids that well. Although, Pink Opal is a bit better since it's drier. They go on like a dream especially the Grey Pearl. I am enjoying them a lot! I want Grey Pearl, or maybe the new Moonlight. I like how creamy and satiny Grey Pearl is, though. And Sapphire is beautiful! I have a mini version of Pink Opal, but it's not my favorite - too sparkly! I've been wanting a deep rich blue pencil for a while. After that Maybelline Master Kajal incident, Sapphire is such a treat. Sapphire has a nice depth and does not look gaudy at all. I love getting those free gifts when I shop at department store counters. I don't think I have ever directly shopped online at any of the beauty brands. I don't think LM counters do many of those, so I was even happier! Beautiful! Never tried these but I love how you pull off bottom liner, it's so gorgeous on you! I don't line my eyes on the bottom that often as it seems to never look right so at most I usually stick with outlining the other 3rd. Will keep my eye out for these. I need to use a primer with these. I have Amethyst and Khaki and I find that Khaki transfers a little... so I must pat on some powder eye shadow to set it. I love the look of Sapphire though! OH DAYUM girl! These shadow sticks are just sooo beautiful!! I love the pink opal and grey pearl shade!! The grey pearl shade I can imagine will look amazing below a purple or a brown! I totally love creamy eye sticks! I've only experienced them from two brands but I would love more! I would love to try mally! I think Pink Opal and Grey Pearl make a beautifully soft smoky look, too! They would certainly go well with brown and purple. and hello! the look is great on you! Shadow sticks like these are great for lazy people like me ;p You created a really lovely look Lena! All three colors are very pretty and pink opal is my favorite. Their body souffle is amazing. I had a couple of them years ago and still remember how much I love them. Pink Opal was one of the limited freebie colors, and I like it quite a bit, too. what a neat product...never heard of these eye shadow sticks, but i certainly like the concept. i'll have to keep an eye out for these. So pretty! I've been eyeing the shadow sticks for a while now. I love the look of Grey Pearl—seems like a perfect everyday shade. All three are gorgeous though, and I really like the look you created with them. I'll have to keep an eye out for another sale! Using all three was not exactly easy but it was worth trying to see how they work. I hope there is another good sale soon, too! Ooh. That is an amazing deal. And you picked pretty colors! :) I love the look that you made! I'm very happy with my choice. They all have great color depths. Sighs... I wish shopping directly from US sites was available for Canadians. We can only buy from department stores. Anyway, I've admired these shadow sticks for a long time but can't make myself get any for some reason. Grey Pearl is super pretty! I never knew the difference before I had managed a retail store. These brands should come up with more perks otherwise the competition with bigger retailers is just too much to overcome. I'm glad to hear they have such great staying power. I actually bought a set of 4 minis and I am so excited to try them! I've been wanting to for a while, and when I saw the set I knew I had to grab it. Oh the mini set is adorable! I would have preferred minis in this case, too. I find the staying power and the color payoffs are bit different shade by shade, but they all provide great base and work wonderfully as all-over-the-lids colors.